My life these past few months has been kind of insane. I’ve been catching up on things that have slipped through the cracks during the chaos. I start working in a week and a half, so I’m expecting another upheaval. I’m trying very hard to clean up my messes before more start. In an effort to do just that, I was looking through my bookshelf at books I needed to review but probably forgot to. The Fifth Season jumped out at me. It was one of my most anticipated books, and I can’t believe I completely forgot to review it. The Fifth Season kind of frustrated me at the start. The world building confused me. The characters took some time to get used to due to unique voices and percpectives. However, I’ve read Jemisin’s work before, and I know that sometimes with her the reward comes after you put in some effort. This book is kind of like a puzzle. Things might not make much sense at the start, but they do all slip into place, and when that happens it is absolutely delightful. Until then, just sit back and enjoy the story as it unravels. It’s detailed, layered, and completely genius. You can’t help but admire that even when you might not understand how it all fits together. The Stillness, the continent where this takes place, is rather ironically named because the last thing it would really be considered is still. There are a lot of earthquakes, and other geological shifts which uproot things. Furthermore, previous “Seasons” or apocalyptic events. Individuals born with special magic to shape and effect the land called orogenes can influence when these seasons happen, and how the land changes. The magic system is rather genius, and shows just what Jemisin does so well. Everything has a price. This powerful magic is often wild and uncontrollable. While these people are incredibly important, most people fear them because they are so unpredictable. Often if they aren’t found and taken away for rigorous training by fellow orogenes, they are killed by family members or neighbors. It’s rather dark, but it is incredibly realistic. Not every power is a power people would want to have, and Jemisin does such a wonderful job showing not just the importance of power, but the uncomfortable price of it. The Fifth Season starts out showing just what that price is, with the death of Essun’s son, who was discovered to be an orogene by her husband, who then took her daughter and ran. In a lot of ways this is a book woven together by love and determination. There is a lot of darkness, and a lot of polarization, but the love of a mother for her children, and the pain she feels, is something that anyone can relate to or sympathize with, and it shines bright throughout the novel. Essun is an unforgettable character with a grounded voice that shows the confusion, pain, and majesty of the world she lives in and the story she is telling. There are two other main perspectives in The Fifth Season, one is a young orogene girl who is being taken away for training, and another is an young woman who is a trained orogene. Her job is to ensure the next generation of orogenes through a selective breeding process. Slowly these stories all weave together and form a rather incredible tapestry. Aside from the world building, it’s really the characters that work so well in this book. They are remarkable, and finely wrought. They are full of contrasts – hope and despair, light and dark, pleasure and pain, and they are obviously honed by the harsh world and the even harsher magic that plays such a huge role in their lives. It’s really incredible how well Jemisin crafted her world, her magic, and her characters. The story is absolutely unforgettable and impossible to put down. It might take a little effort for readers to get into it because it can be a little confusing at the start, but even then it’s hard not to appreciate the magic of this book. 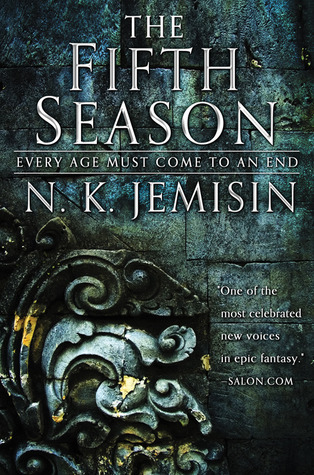 This is the first book in a trilogy, and Jemisin did an incredible job laying the groundwork for future books, and telling an amazing story while she did it. As I said above, I’ve read Jemisin’s work before, but when I look at all of her books that I’ve read, this one is probably my favorite. It shows everything that Jemisin does so well, excellent world building, complex characters, and a layered, addicting plot. This book has it all.